Henry Bagdasarian is the Founder and Editor-in-Chief of identity-theft-awareness.com which was launched in 2006 to educate consumers and employees about identity theft risks and solutions. This free website serves hundreds of articles to thousands of visitors each month and is consistently listed as a top rated identity theft blog by major search engines. Henry is a certified expert in information security and identity management. He is an active data protection and identity theft blogger who has authored hundreds of articles posted on this website. He has held Chief Information Security Officer (CISO) and Chief Privacy Officer (CPO) positions as well as corporate leadership roles in Compliance, Internal Audit, and Technology Risk Management in leading public, private, and regulated organizations. Henry's career profile including corporate experiences, education, and a few of his published articles can be viewed on LinkedIn. His career selection and progression strategy is also discussed in this personal article. Over the last few years, Henry has contributed enormously to the identity governance, access management, and data protection fields by proposing new solutions and introducing new industry terms and recognized brand names. 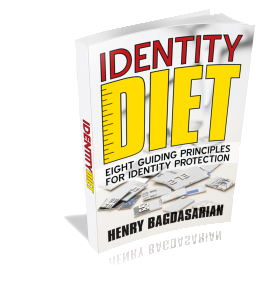 **Identity Diet was initially a book idea that Henry published in 2010 to introduce Identity Obesity as a leading cause of identity theft, as well as the Identity KAOS framework offering 8 identity protection principles which were later embedded within the Certified Identity Protection Advisor® (CIPA) study materials and testing. **Identity Management Institute (IMI) is a recognized international member-based organization in identity risk management which was founded by Henry to provide thought leadership, training, and registered certifications to global companies and their professionals. **Information KAGE is a simple information security framework which Henry has proposed for information protection. The framework offers 4 easy data protection steps and is embedded in the Certified in Data Protection (CDP) training and certification program. **LinkedIn Identity Theft group is the largest identity theft discussion group that connects thousands of experts from all around the world to collaborate and collectively solve today's identity theft challenges. **LinkedIn CISO group is a fast growing online discussion group connecting, and promoting collaboration among global Chief Information Security Officers. Henry continues to lead major corporate functions, advise executive management and board members, partner with educational and non-profit institutions, and support Identity Management Institute to promote and innovate the identity governance and risk management industry. Henry Bagdasarian believes that companies and government agencies, which collect consumer information as part of their business operations have not only a moral duty and sometimes legal obligations to protect their customer information, they must also educate their customers, employees and business partners about the risks of identity theft and best identity protection practices to reduce risks. Although, some companies attempt to protect consumer identities and privacy within the boundaries of their business environment and miserably fail once in a while, awareness and education is not even built into their overall information security program to reduce identity theft outside of their business environment which is a big risk not to be ignored. As such, Henry hopes to bridge the gap between companies, their customers and service providers to collectively and effectively protect all personal information at all times. Although, identity theft awareness and education campaigns for external parties such as customers can be very costly, this website was developed and continues to be maintained by Henry Bagdasarian to provide free identity theft awareness and education to the general public. Businesses can refer their customers and employees to selected articles of their choice on this website to reduce their fraud costs. To conclude, companies and individuals must be educated and consider the risks of identity theft and fraud resulting from their actions or inactions when dealing with any personal information. This identity theft awareness web site hopes to leverage Henry's expertise, passion, and dedication to educate everyone about the evolving risks of identity theft and propose appropriate solutions. Feel free to browse the site or search a specific topic from hundreds of identity theft articles using the search box below. Personal Online Child Safety Story As our children use the Internet to socialize, they also place themselves at risk. My personal story in this article illustrates how dangerous the Internet can be for online child safety. Become Data Breach Resilient Learn to become data breach resilient by documenting response plans, identifying stakeholders, performing exercises, adjusting plans as needed, and training employees. What is Cyber Security Internet security is a subset of cyber security, and, cyber-security is a subset of information security which is just the security of any system or digital data excluding all other forms of data. Information Security Spending Information security spending has been growing steadily and is an investment priority for many businesses which are fearful of data breach incidents. Learn why security spending is rising and how you can reduce security costs. Fist In A Bucket Of Water Some may think that any employee is just a fist in a bucket of water, but without key performer employees, long term business success may not be assured. At Will Employment At will employment is a term used in U.S. labor law which allows an employer to dismiss an employee for any reason on the spot. Learn why this is not good for business. The Biggest IT Challenge The biggest challenge for any Information Technology (IT) organization is to motivate the team members whether at management or staff level to see the big picture for their businesses. Privacy Extremism Privacy extremism is not very different very other types of extremisms and some companies interpret the laws erroneously and apply extreme privacy practices. Facebook Destroys Relationships Although Facebook helps people find lost old friends and remain in contact with freinds, Facebook destroys relationships when the system is abused and misused by Facebook users. Trusting Others Trusting others may be voluntary or an obligation which can pose various risks depending on the relationships. Choose Friends Carefully We must choose friends carefully online because not only information travels faster online but also we may not fully know our digital friends and have less control over what they share with others. Wild Wild West Consumers are being hit with back to back economic scams as in the old lawless Wild West and may not be able to sustain their lifestyles and keep their dreams alive with no one in sight to protect them. Product Tampering Risks Using over the counter products or public products such as soap and shampoo at the gyms or hotels can pose a serious product tampering risks due to unauthorized and illegal modifications. Bigger Than the Opportunities Some people may feel rejected or have a low self esteem due to layoffs and longer periods of unemployment; however, many of them are bigger than the opportunities in the job market. Linkedin Recommendation Writing a Linkedin recommendation for a colleague can be a difficult task if we want to make sure our recommendation fully reflects the professional experiences, talents and personality of the person. Identity Management Careers The list of identity management careers is growing and provides a vast array of career opportunities requiring a special set of skills depending on the job duties within an organization. Career Beacon When we consider pursuing a career, our decisions must be based on a career beacon that guides us based on our true values, desires and talents. Managing Linkedin Connections Many professionals use Linkedin for managing their professional networks, however, managing Linkedin connections should not be taken lightly if solid relationships are desired. Career Management There are many components in career management that need to be carefully addressed in order to create a satisfying and lasting successful career. Professional Networking There are many benefits to effective professional networking inside or outside a company. However, to be effective, networking must be performed with due care. Layoff Lessons There are many layoff lessons we can learn from business reorganizations and I’ve identified six layoff benefits from my own experience. Professional Certification This analysis is made to determine the value a professional certification can provide to both certificate holders and company management. My Professional Career Throughout my professional career, I have learned to apply my intuition and knowledge when making adjustments to my career path in order to ensure a satisfying and challenging professional life. Use the form below to contact Henry Bagdasarian.